The city of Monterey Park, California, is located approximately seven miles (10 km) east of downtown Los Angeles. With a population of over 60,000, the community obtains 100% of its water from local groundwater. Twelve wells, some as deep as 1,800 feet, provide a peak pumping capacity of 20 million gallons per day (mgd) and produce an average of 10 mgd. Located in the Main San Gabriel Groundwater Basin, the quality of water produced from the wells is mixed. 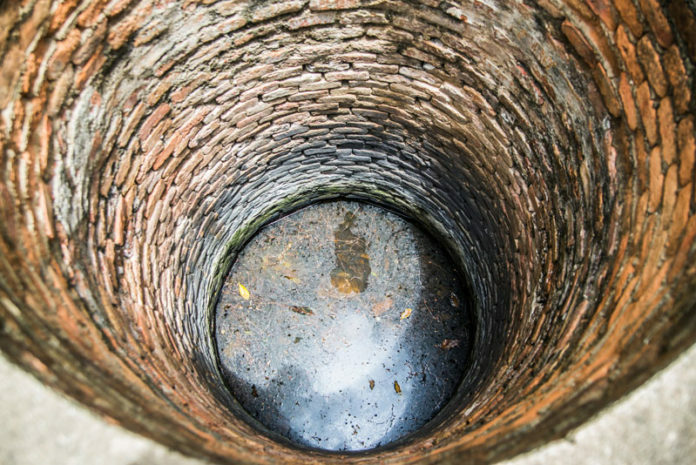 Deep wells produce water of excellent quality while some shallower wells are impacted from contamination derived from industrial sources dating back to World War II. The city takes extraordinary steps to monitor and treat groundwater, including collecting 250 samples per month and operating five groundwater treatment facilities to remove, among other contaminants, volatile organic compounds (VOCs) such as tetrachloroethylene (PCE) and trichloroethylene (TCE). PCE and TCE are detected at concentrations up to approximately 100 micrograms per liter (µg/L) in raw water, with PCE typically at higher levels than TCE. More recently, the solvent stabilizer 1,4-dioxane was also detected in some wells at concentrations of one to two µg/L. Finally, another set of detected-contaminants of note are the perflourinated compounds (PFCs). For example, Perfluorooctanesulfonic acid (PFOS) was detected in the raw water with a maximum of 16 ng/L, which is slightly above the California unregulated notification level (NL) of 13 ng/L. The maximum concentration of perfluorooctanoic acid (PFOA) detected in the raw groundwater was 8.4 ng/L, which falls below the NL of 14 ng/L. In 2015, the city received a Proposition 84 grant to fund a treatment project. While VOCs can be removed with conventional contaminant treatment technologies, such as air stripping or granular activated carbon (GAC), the solvent stabilizer 1,4-dioxane requires more advanced treatment technology. Its low volatility and high solubility in water makes air stripping ineffective, and it is poorly adsorbed to GAC. This leads to rapid breakthrough and would therefore require frequent and expensive change-out of the GAC media. 1,4-dioxane requires treatment by the UV advanced oxidation process (UV AOP), the combination of UV light with hydrogen peroxide. With regard to PFCs, PFOS, PFOA and others – all were found to be non-detect at post GAC sampling locations at Monterey Park. This suggests that for Monterey Park, GAC is an effective treatment option for PFCs. UV AOP relies on the in-situ generation of hydroxyl radicals to break down chemical contaminants in water. A well-accepted method to generate hydroxyl radicals is through the exposure of hydrogen peroxide (H2O2) to UV light. Monterey Park selected low-pressure, lamp-based UV/H2O2 UVAOP for treatment of both VOCs and 1,4-dioxane. Further, the decision was made to re-order the treatment train to utilize the oxidative power of UV AOP for the removal of 1,4-dioxane as well as VOCs, and to modify the existing GAC system to utilize a different type of GAC media for the removal of residual H2O2 – low levels of halogenated alkanes that are not removed by UV AOP if present – any potential degradation by-products and PFCs. Monterey Park will lead the way in California with this approach. Given the importance of demonstrating success of this combined treatment process to regulators in California, the following were important considerations in the UV AOP technology selection: water quality impact, lamp technology choice and process control design. The mechanism of the UV AOP is a combination of UV photolysis of contaminants (UV light breaking down contaminants directly) and oxidation of contaminants by hydroxyl radicals (which are generated via the photolysis of hydrogen peroxide). Therefore, to be effective, the applied UV energy must be absorbed by the contaminant molecule and/or the hydrogen peroxide molecule. UV transmittance (UV-T) – a measure of the ability of water to transmit UV light – is one of the most important water quality parameters that affects UV performance, including disinfection and UV AOP applications. Temperature, pH and water matrix composition also play significant roles in the UV AOP (Stefan, 2017). With respect to water matrix, the hydroxyl radical scavenging demand of the background water matrix also impacts UV AOP system sizing. And last, for Monterey Park, the presence of nitrate affected UV lamp technology selection. One of the key water quality parameters that impacts the efficiency of the UV AOP process when medium-pressure (MP) UV lamps are employed is the nitrate ion (NO3-) concentration. Nitrate is a strong absorber of UV light at wavelengths <240 nm. MP lamps emit a significant amount of UV light in this range. In fact, approximately one third of the UV energy emitted by MP lamps is at wavelengths below 240 nm. Since low-pressure (LP) UV lamps emit light primarily at 254 nm, where nitrate absorption is relatively low, nitrate impact on the UV AOP with LP lamps is significantly less. The Monterey Park groundwater wells have nitrate concentrations ranging from 10 to 18.2 mg/L (as NO3-), levels that are well below regulatory limits but high enough to impact treatment with MP lamps. This elevated concentration results in a significant portion of the emitted UV light from MP lamps being absorbed by nitrate. The input power of MP lamps would, therefore, need to increase to compensate for this absorption. A power ratio of MP:LP of two to three is typically observed in most (low-nitrate, e.g. <1 mg/L as NO3-) applications of UV (drinking water, industrial, etc.) and is derived from the fact that there are inherent electrical efficiency differences between MP and LP lamps. 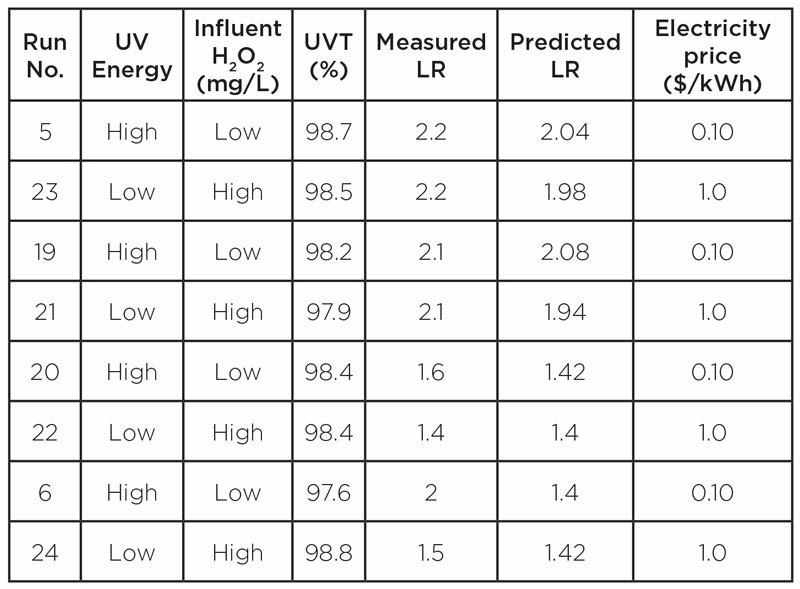 The USEPA’s UV Disinfection Guidance Manual (Table 2.1) states that MP lamps have an electrical-to-germicidal UV conversion efficiency of 10% to 20% while LP lamps have a conversion efficiency of 30% to 35% (US EPA 2006). However, due to the presence of relatively high concentrations of nitrate in water entering the UV system at Monterey Park, the power differences between an LP UV lamp-based system and a MP UV lamp-based system would have been higher than typical. In addition to MP wavelengths being absorbed by nitrate rather than being used to degrade target contaminants, the absorption of that UV energy by nitrate (NO3-) also leads to the formation of nitrite (NO2-). Nitrite is a regulated by-product (with a 1 mg/L [as N] US EPA maximum concentration level) and is also a potent hydroxyl radical scavenger, which reduces the concentration of hydroxyl radicals available for contaminant degradation. For example, hydroxyl radicals react approximately five times faster with nitrite ions than with PCE molecules. The efficiency of the photoconversion of the nitrate ion to the nitrite ion is driven by the quantum yield of this photoreaction. In general, for every 10 UV photons absorbed by the nitrate ion, one molecule of nitrite ion will be formed. Since the 254 nm UV wavelengths emitted by LP UV lamps are very poorly absorbed by the nitrate ion, very few nitrite ions are formed when using LP UV. On the contrary, the low wavelengths (i.e., <240 nm) emitted by MP UV lamps are strongly absorbed by the nitrate ion, resulting in significant formation of nitrite ions. The net result is that when using MP UV lamps, the presence of nitrate ions reduces the amount of UV energy available to create hydroxyl radicals and also indirectly consumes (thorough hydroxyl radical scavenging by the nitrite ion) many of the hydroxyl radicals that are generated. A deterministic sizing model for designing and operating UV AOP systems has been developed and validated. This model was applied for the design of a hypothetical medium-pressure option for Monterey Park, taking into account all of the factors described above. The MP power requirement, as predicted by the sizing model, is approximately 12 times that of the LP power requirement under the treatment conditions for Monterey Park and would lead to an additional annual electrical power cost of >$3.5MM (at $0.12/kWh). For comparison, this sizing exercise was repeated in a low nitrate condition (e.g. <1 mg/L), and the MP:LPHO power ratio was reduced to 2.9, a much more typical MP:LP power ratio representative of low nitrate conditions. The design of the UV system at Monterey Park was based on a UV-T of 98%, a PCE treatment target of >2.0 log reduction, and a 1,4-dioxane treatment target of >1 log reduction. The installed TrojanUVPhox consists of three trains of three chambers and a H2O2 dosing and storage system. The installation is pictured in Figure 1. Figure 1. The TrojanUVPhox™ UV AOP system at Monterey Park. Photo courtesy of Trojan Technologies. After the TrojanUVPhox UV AOP system was installed and commissioned, an extensive performance test was conducted to show the effective removal of 1,4-dioxane and PCE and to demonstrate the effectiveness of the control system to adjust UV power and H2O2 dosing to achieve the desired contaminant removal. Flow rates were varied, water from different wells was mixed and a UV-T modifier – Super Hume (SH) – was added to challenge the system performance and the accuracy of controls. No contaminants were spiked during the test. The natural influent concentration of PCE varied from 39 to 93 µg/L, and 1,4-dioxane varied from 1.3 to 1.6 µg/L depending on the source water (i.e., from a single well or two wells mixed). A total of 24 test runs were conducted and results reported in Figure 3. Run #1 is a control test without hydrogen peroxide dose and UV ballast power. Run #2 is a photolysis test in which only UV ballast power is applied. Runs #3 through #24 are tests with various water flows, UV ballast power, hydrogen peroxide dose and UV-T (range from ambient UV-T to 97% UV-T). Runs 11 through 20 were conducted with the injection of SuperHume to reduce ambient UV-T. Sampling locations are illustrated in Figure 2. Figure 2. Sample locations: 1) Pre-cartridge filter; 2) pre-UV; 3) post-UV; 4) GAC1 and 5) GAC2. Image courtesy of Hazen. As shown in Figure 3, 24 runs of UV AOP system performance testing were conducted. PCE was effectively removed, and UV AOP process control model predictions agree with measurements. 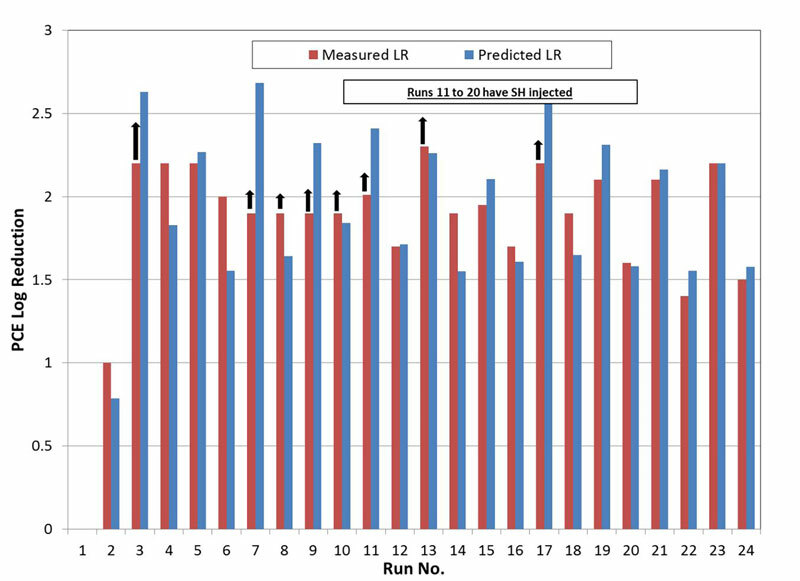 Black upward arrows denote measured log reductions (LR) limited by PCE measurements post treatment reaching non-detect. Similar results were obtained for 1,4-dioxane. Figure 3. Performance test results and comparison of measured and predicted PCE log reductions. Black upward arrows denote measured log reductions limited by PCE measurements post-treatment reaching non-detect. A UV AOP system is an integration of UV reactors, H2O2 storage and H2O2 dosing. UV reactors are designed and optimized to deliver UV reduction equivalent dose (RED) efficiently with headloss and physical footprint also being important design considerations. Drinking water grade H2O2 needs to be stored safely and properly. The H2O2 injection location needs to be carefully chosen to ensure complete mixing of H2O2 with the bulk water before entering the UV reactors. An accurate and reliable metering pump is required for accurate H2O2 dosing. To coordinate these components, a programmable logic control (PLC)-based online UV AOP control system is the brain of the overall UV AOP system. It determines, in real time, the UV power level and H2O2 dose required to meet a target contaminant log reduction (LR). Further, it selects the combination of UV power and H2O2 dose that results in the lowest operating cost for the system using site-specific cost inputs of electrical energy and H2O2 etc. Specifically, in determining the required UV power, the PLC selects the required number of reactors per train and the ballast power level at which the UV lamps should be operated. The UV AOP control system used at Monterey Park is based on first principles of photochemistry together with advanced CFD UV fluence models for the specific reactors. In addition, key water quality parameters, such as the hydroxyl radical scavenging demand the measured UV-T and the nitrate concentration, are input into the predictive model. This scavenging demand capacity measures the total demand for hydroxyl radicals from all constituents in the water matrix. The hydroxyl radical scavenging demand was measured at Trojan’s lab. The goal of this smart system is to control the AOP system automatically to meet desired log reduction targets of contaminants. In order to demonstrate the smart control system, eight test runs were conducted. The results, shown in Table 1, illustrate the effective removal of PCE by the UV AOP system and the ability of the control system to minimize O&M costs under varying conditions while maintaining target performance. Runs 21 to 24 are replicates of the other test runs but with the electricity price input into the system controls increased by a factor of 10. This artificial change drives the system to maximize the H2O2 dose and reduce UV energy while maintaining the target LR to minimize spending on electricity. As the system increased H2O2 dose and decreased energy, the log reduction performance was maintained. For example, run 23 accomplished identical PCE treatment (2.2 log reduction) while using high peroxide and low UV energy vs. the relatively lower UV energy and higher H2O2 dose while running with electricity prices at normal vs. elevated levels (run 5). This demonstrates that the system can balance UV power and H2O2 in multiple combinations to achieve the treatment target. The overall performance tests confirmed that UV AOP is effective for removing PCE and 1,4-dioxane. Testing also confirmed that the control algorithm for the calculation of PCE removal can be used as an effective control for energy and hydrogen peroxide dosing. PFOA and PFOS in the raw water were removed by GAC. Overall, the extensive sampling confirmed the efficacy of the treatment process. UV AOP for contaminant treatment is not limited to groundwater applications. For example, there are numerous installations using UV AOP in advanced wastewater treatment for potable reuse. UV AOP also has been extensively used in surface water treatment applications to improve taste and odor and to simultaneously provide validated disinfection. Overall, the fundamentals described in this article related to UV AOP system design and operation are applicable across these segments. In addition, the results of the Monterey project showed that UV AOP in combination with GAC can be an effective dual treatment system for emerging contaminants of concern, including 1,4-dioxane and PFCs. As water scarcity increases, water providers will increasingly be driven to utilize impaired water sources and treat them with advanced technologies such as UV AOP. The city of Monterey Park selected and installed an LP UV lamp-based UV AOP system for treatment of groundwater impacted by VOCs and 1,4-dioxane for potable use. The presence of nitrate in groundwater was a significant consideration in choosing the LP system due to the overall impact that nitrate has on process efficiency. Results from an extensive performance test showed effective removal of 1,4-dioxane and PCE, as well as robust control of UV power and H2O2 dosing to achieve contaminant removal at various conditions. The controls strategy applied for groundwater treatment – which incorporates real-time flow, UV-T and inherent scavenging demand – plays a key role in ensuring effective contaminant removal while minimizing operating cost. 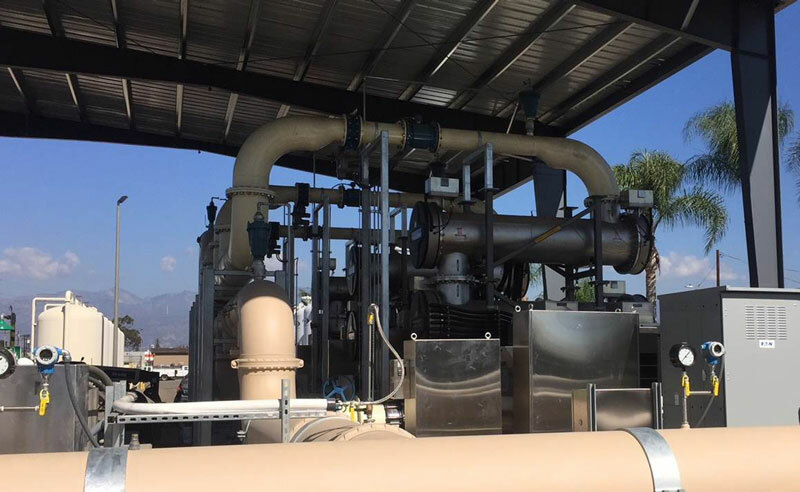 In combination with GAC, the UV AOP system at Monterey Park successfully demonstrated effective treatment of contaminants and provided a valuable case study for the treatment of groundwater for potable use. Stefan, M.I., (2017) “Advanced Oxidation Processes for Water Treatment: Fundamentals and Applications,” IWA Publishing. US EPA (2006) “Ultraviolet Disinfection Guidance Manual for the Final Long Term 2 Enhanced Surface Water Treatment Rule,” US EPA.